Last year we took The Boy to the cinema for the first time to see the Thomas & Friends film 'Blue Mountain Mystery', which was a complete delight. He was enchanted and, as we were then lucky enough to receive a copy of the film on DVD to review, we have been able to enjoy the film plenty of times during the past year. Well Thomas & Friends have done it again with another cracking feature-length CG film, currently in VUE cinemas until Sunday 1st September, the day before the DVD is released in shops. 'King Of The Railways' is an even more captivating film introducing several new characters with plenty of personality. The main new engine is Stephen, an ancient steamie brought to the island by the Earl of Sodor who is rebuilding the ruined castle. Stephen was one of the first steam engines, aptly nicknamed The Rocket at the time (a lovely reference to George Stephenson's Rocket, Stephen is even the same design and colour) because of his speed. Rather than being grumpy at not being needed anymore, Stephen endears himself to Thomas and his friends with his good-natured humour and journey to find a purpose on the island, and to help the Earl with his project. Unfortunately, the day before the opening of the castle, Stephen goes missing mysteriously; can Thomas be a really useful engine and save the day? We took The Boy to see the film in the cinema on Sunday, and despite having seen it several times via our review copy last week, he was wowed by the big screen and spotted new aspects to the story. At only £4.50 a ticket for adults, it was well worth the trip and I'd recomment it before it comes out on DVD. This is definitely a classic Thomas & Friends film, really enjoyable for both adults and children. 'King Of The Railways' is out on DVD on Monday 2nd September with an RRP of £12.99, and is currently showing at VUE cinemas daily until Sunday 1st September. However, I have one copy to give away to a lucky reader. 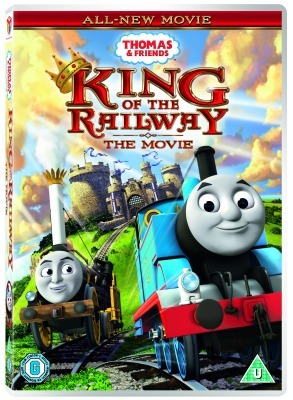 Simply fill in the Rafflecopter form below to be in with a chance of winning 'King of the Railway' on DVD. I received a copy of this DVD for the purpose of this review. My opinion is honest and unbiased. Thomas is Harry's favourite. Personally, I am a fan of James, always have been. Thomas loves Thomas, obviously! Jasmine loves Emily and Ben loves Percy. My youngest son loves James, simply because he's red, lol. He changes his 'favourite' every day but Edward or Diesel 10 are the current ones. He is Thomas the Tank Engine obsessed. My two boys love so many different engines!! My youngest loves Thomas and his older brother is currently Victor's biggest fan :-). Thomas is the favourite, but he should be red like James! My son is fascinated by Diesel 10. It's Thomas, and depending which Thomas film we have recently watched he has to be accompanied by various friends! My son loves all the engines but his favourite one has to be Gordon! Thomas…and James…and Gordon…and Edward…and Percy…and Diesel…and pretty much EVERY engine! !